Bangladesh will take up the Rohingya issue with Germany during the prime minister's visit to Munich, aiming to mount pressure on Myanmar to repatriate its nationals from Bangladesh. 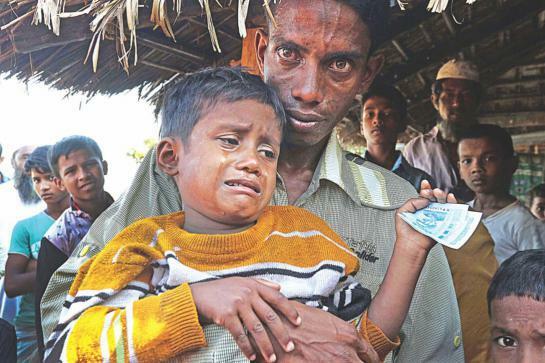 "We've already talked to the European Commission on the Rohingya issue. And of course, the issue will be discussed at a meeting with Dr Angela Merkel," Foreign Minister AH Mahmood Ali told a press conference at the Foreign Ministry on Wednesday. A Bangladesh delegation, led by Prime Minister Sheikh Hasina, leaves here on Thursday for Munich, Germany, on a four-day official visit to attend Munich Security Conference (MSC) and the prime minister will hold bilateral talks with German Chancellor Angela Merkel on Saturday next. Mahmood Ali said the whole world is with Bangladesh over Rohingya issue while the United Nations has already criticised Myanmar in strong words for persecution of Rohingya people. "We think we're on the right track over Rohingya issue because the world has realised how much sufferings the Rohingya people have been going through," he said. About relocation of Rohingya people to Thengar Char in Hatiya, the Foreign Minister said Cox's Bazar is the country's main tourism spot and it cannot be allowed to be destroyed. "We have to consider the environment and also the problem of local people." He said Rohingya people will not be there at Thengar Char forever as they will be repatriated to their homeland. Mahmood Ali said Rohingya people are not being relocated right now. Infrastructures will be built and livelihood options will be created there before their relocation to Thengar Char, he added. The government has started the initial process to gradually shift Rogingyas to Thengar Char in Hatiya, Noakhali.